An artist’s rendering of a look at Gotham City, the Batman-themed land at Warner Bros. World Abu Dhabi. 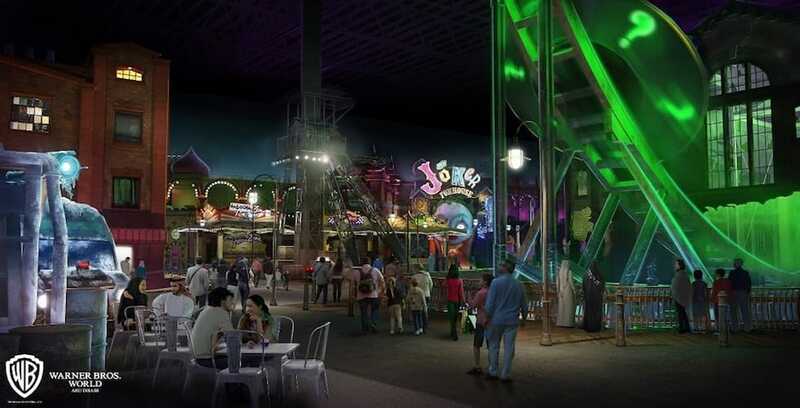 Warner Bros. World Abu Dhabi has revealed details of the rides in Gotham City, the land themed to the Batman universe. Designed to look just like Gotham, guests will walk the street with characters like the Joker, Harley Quinn, Scarecrow, the Riddler and Catwoman. The land will feature an immersive simulator ride called Batman: Knight Flight. Guests will board a robotically-controlled flying Batwing to aid Batman in his fight against crime in Gotham. A look at the flight simulator attraction, Batman: Knight Flight. The ride will begin at Wayne Tech headquarters, as guests step through a secret panel to discover that they have been recruited as test pilots for the aircraft. This simulator will use immersive effects and scenery, along with spins, drops, rolls and climbs to tell the story. Inside The Joker’s Funhouse, guests will find a labyrinth, a hall of mirrors, shrinking corridors and more. They can also play a variety of games at Rogues Gallery on Gotham Pier. Restaurants in the new land include the Hall of Doom, a restaurant designed to look as though it’s hidden in an abandoned subway station, and the police-themed Gotham City’s Finest. Guests can also satisfy their sweet tooth with Mr. Freeze Ice Scream Truck in the heart of Gotham City’s industrial zone. Shopping will also be abundant in the land, with stores like Park Row Pawn Shop, Monarch Theatre Gifts, Harlequin Confections, Cat’s Eye Jewelry, and Cobblepot Formal Wear. Warner Bros. Abu Dhabi will feature a total of 29 rides, interactive attractions and entertainment across six themed lands when it opens this summer. For more information on the park, visit WBWorldAbuDhabi.com/en.